These sweet potatoes by Caitlyn Milligan of Milligan Movement make for an easy, prep-ahead meal that is sure to liven up Taco Tuesday. Poke holes all over the sweet potatoes and cook in the microwave for 5-6 minutes on high. Let them cool and place in a baking dish. Slice the potatoes in half longways and carefully scoop out the sweet potato. Place the sweet potato skins off to the side -- these are your taco bowls. Mash up the scooped potatoes, begin to add in your olive oil and add a pinch of salt and pepper. Evenly distribute the mashed sweet potatoes back into their skins. In a large skillet, over medium-high heat, cook ground turkey, breaking up into pieces, until cooked through. Add in garlic, chili powder, oregano and paprika, and top with a sprinkle of salt and pepper. Cook for 1 minute. Stir in the crushed tomatoes. 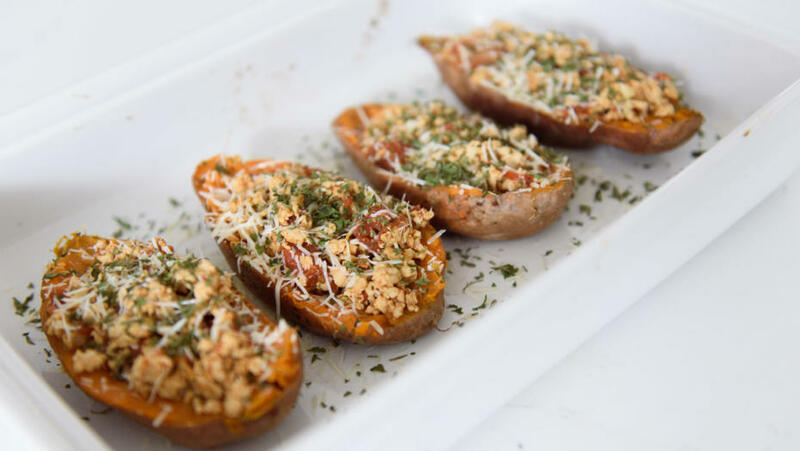 Spoon turkey mix into the sweet potato skins. Top with cheese. Place in oven to warm and allow cheese to melt. Enjoy!